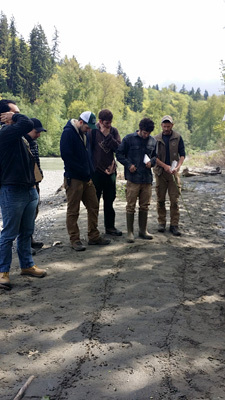 The end of the school year is quickly approaching for the students of the Alderleaf Wilderness Certification Program (AWCP). They have a lot going on at this time of year. They are working on permaculture projects, wrapping up the last of the homework assignments, as well as preparing for our last two field trips and graduation. 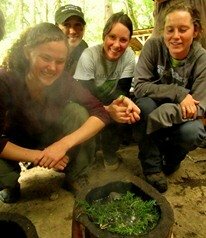 However this week’s wildlife track & sign evaluation was more like an incredible adventure. The students got to experience the great pleasure of having one of the best trackers around shed some light on the world of tracking. Casey McFarland is one of only five Senior Trackers here in the USA. He is an evaluator for CyberTracker Conservation International. He truly is an amazing individual with his unique & sincere style of sharing which makes learning effortless. He says that tracking is like learning to read. As humans we are used to processing symbols and once we learn the symbols that the animals leave, we will be able read the stories left by them in nature. 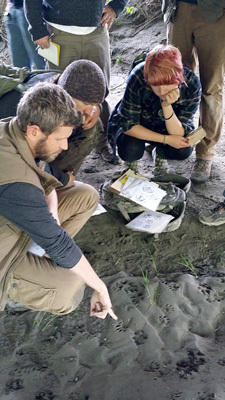 Learning the art and science of tracking is not only for professionals like biologists, researchers, or naturalists. Anyone who loves nature will find it quite rewarding. Not only is it a really exciting way to learn about the world we live in, it’s something we can practice right in our own back yards! The ability to interpret what is going on in nature is such a great feeling, it helps us realize that we as humans are not the only ones who rely on the earth for shelter, food and water... we begin to see they have families, routines, and food preferences as well as favorite routes in which they will travel, much like we do. 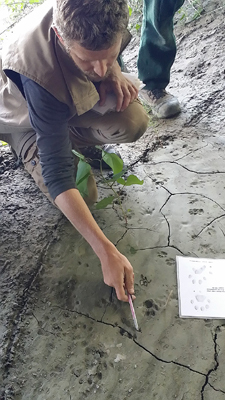 In this first photo, Casey is going over the foot morphology of a river otter and pointing out the key features explaining how we can be sure that we are looking at a river otter. 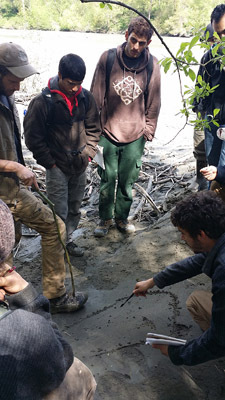 In the second photo the students are looking at a raccoon track. Not only do we talk about the distinguishing features of a perfectly clear track, but we learn to recognize signature marks that will tell us who it was even in some of the most difficult substrates and conditions. In the photo above, the students are asked who this animal was and how it was moving across the land. 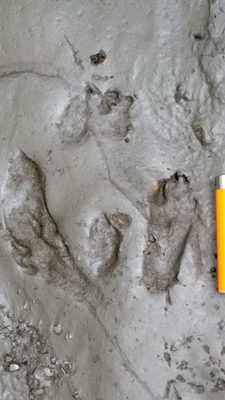 Knowing the shape of an animal and where they carry their weight can help you determine if a track is a front or a hind foot. You can also tell if it is a left or right in very much the same way you can tell the difference between our left and right hand. Here, a student is giving his interpretation of what happened. This was a Robin doing a run and stop movement as it searched for food. This is a common behavior for the American Robin. 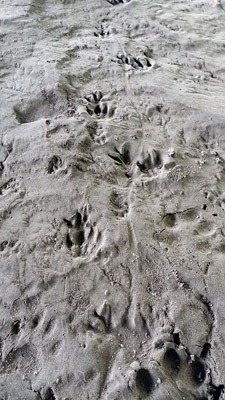 Here are the tracks of a cotton tail who decided to sit down. Here is a nice muskrat trail. You can even see the tail drag here. After taking the track and sign evaluation the students were able to see just how much they had learned throughout the year at Alderleaf as they passed with flying colors. Many of our students even scored a level 3 certificate which is no easy task! 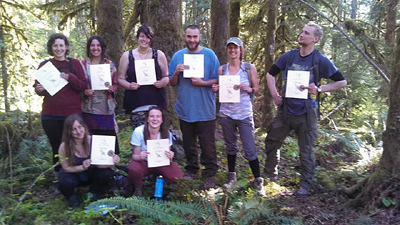 Learn about the Alderleaf Wilderness Certification Program, our in-depth, nine-month course that trains students in wilderness survival, permaculture, wild edible & medicinal plants, wildlife tracking, naturalist, and outdoor leadership skills.